As you may have already guessed (it would be inexcusable not to — you have read the title, haven't you? ;)), the article will dwell on the first SCSI 10K 2.5-inch drives, that is Seagate Savvio 10K.1. 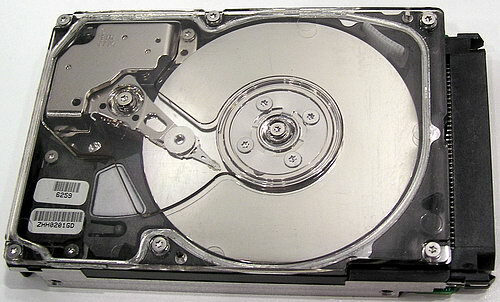 Seagate is again ahead of its competitors, like in the years past, when the company was the first to manufacture 3.5-inch storage drives with the spindle rotational speed of 7200 rpm, 10000 rpm, and then 15000 rpm. 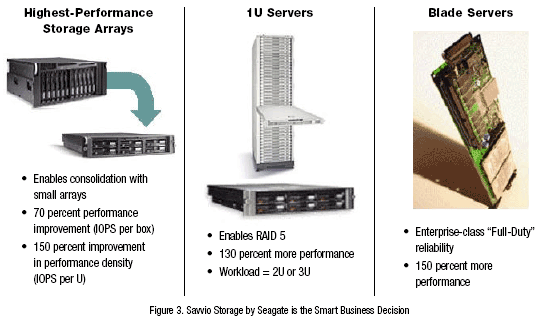 improved scalability of storage solutions. For example, according to Seagate, RAID 5 with Savvio drives in a 1U server (they have been manufactured in increasing volumes in the last years) will dissipate less power and provide higher IOPS performance than the same array of 3.5-inch drives in a 2U server. On the whole, Savvio drives make it possible to build servers and data storage systems in smaller formats (for example, to switch from 2U to 1U or from 3U to 2U) and increase IOPS performance, retain or slightly increase the total capacity at the same time. What concerns blade servers, Savvio drives actually became the first and only enterprise storage devices. Before these models appeared, we had to use regular notebook storage drives with significantly worse performance and reliability (one Savvio offers better reliability of round-the-clock operation than a mirror of two 7200-rpm notebook drives). Finally, according to the forecasts made by respected IDC, the demand for 2.5-inch 10000rpm drives of the enterprise class by 2008 will reach about 10 millions a year! Even the modest ball park of market demand for 1U servers is one million a year, that is in case of five-drive RAID 5 for this segment only, we need about 5 million 2.5-inch enterprise storage drives a year! For your information, Seagate sold 3.1 million Enterprise storage drives for the past quarter (mostly 3.5-inch drives). Approximately the same figures apply to the current demand for blade servers, where Savvio drives are also more preferable (though in smaller numbers) than notebook drives. At the same time, a year after these drives appeared on the market, we can establish a fact that unfortunately the interest of many key manufacturers and consumers to Savvio drives hasn't been straightforwardly positive. Many people complain about weakly developed accessories (for example, chassis, cages, and PC cases) for mounting such storage devices. Some time ago a large shipment of Savvio drives to one of the well-known Russian distributors has been "a lump in a throat" — demand for these drives was extremely low. However, this situation is not rare for principally new and revolutional products, which infrastructure is not yet ready. Especially as Savvio project was initiated mostly due to the efforts of one company — HP, one of the major enterprise partners of Seagate. 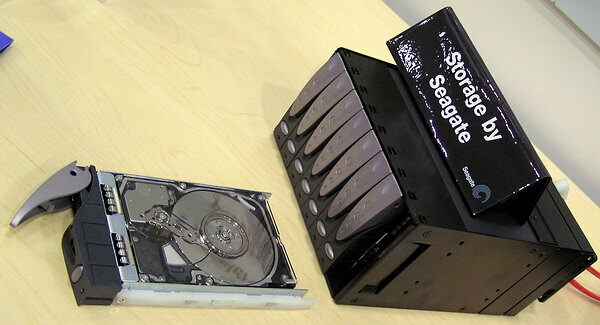 HP engineers took active part in designing Seagate Savvio. It was actually HP who was the main consumer of these drives and praised them so much. 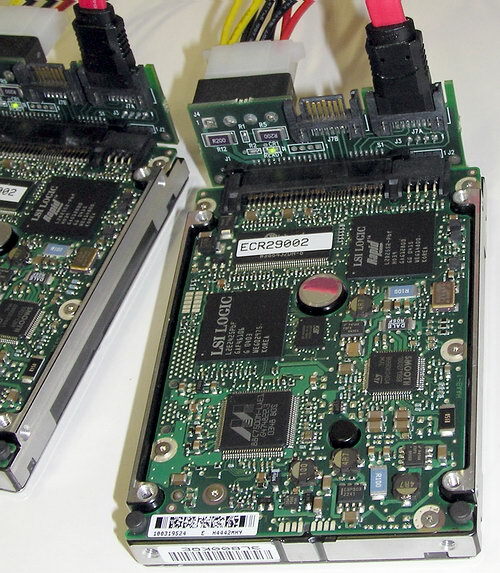 Seagate Savvio 10K.1 with Fibre Channel, SAS and SCSI interfaces (the photos were taken by the author at IDF Spring 2004). interest to these models grew considerably and some manufacturers became more active in offering chassis for them. there are also cages with a single (!) 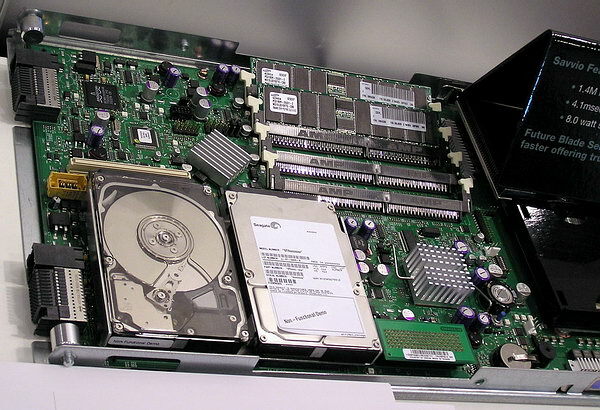 5-inch bay (for example, Supermicro), which can accommodate four such drives. They look very cute. Besides, these tiny ones make it much easier to create 4 and 8-drive RAIDs. 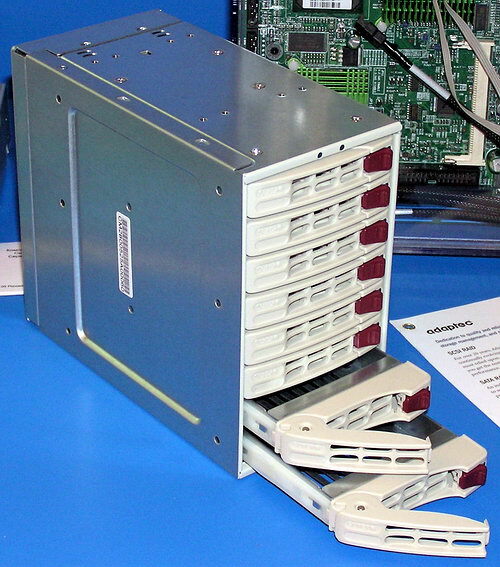 It's a pity these cages are mostly intended for SAS storage drives, while it's still problematic to find them for SCSI Savvio models (expert users may offer modifications of such cages in our forum, in the thread devoted to discussing this article). By the way, plural for Savvio is nothing else but Savvii. :) Savvio is a combination of Savvy + I/O. There already exist cages for 24 Savvio drives in 2U format. We have also heard that a 2U cage may accommodate up to 30 such drives. There also exist standard constructions for blade servers using drives of this format (see the photo). By the way, Seagate has been recently followed by Fujitsu, who has recently announced 2.5-inch enterprise drives. This series is called MAV20xxRC. Like Savvio, it contains only two models of the same capacity and with similar characteristics. But Fujitsu intends them for the SAS interface only (there are no models for SCSI and FC). Unfortunately, we haven't seen them in retail yet. However, the same concerns SAS Savvio. The photo below shows the interior. Insides of Seagate Savvio 10K.1. 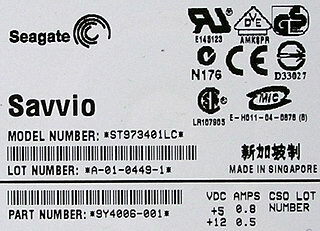 Designation of Seagate Savvio 10K.1 ST973401LC, which we used in our tests. Seagate Savvio 10K.1 ST973401LC from the direction of the controller. By the way, if we compare controllers from Savvio, Seagate Cheetah 15K.4, and Cheetah 10K.7, we'll find out that they are very much alike — they use the same circuit technology (LSI Logic L2D2348, Marvell 88C7500M controllers, Smooth 100331044 driver (and 100271388 for Savvio), 6ns 64 Mbit DRAM and flash memory from SST). Although the layouts are different, they are actually the same controllers with insignificant hardware modifications and slightly different firmware versions. 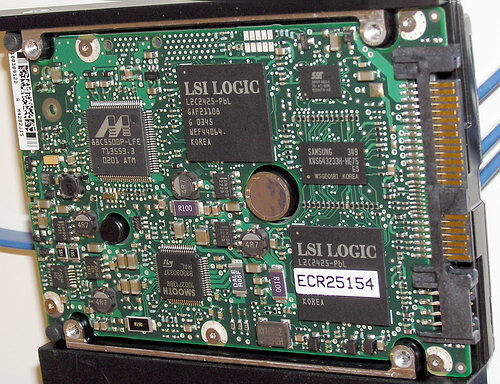 Running a few steps forward, SAS Savvio models also use the main processor from LSI Logic — to be more exact, a couple of L2C2425 chips to provide two independent channels (as required by SAS specifications). 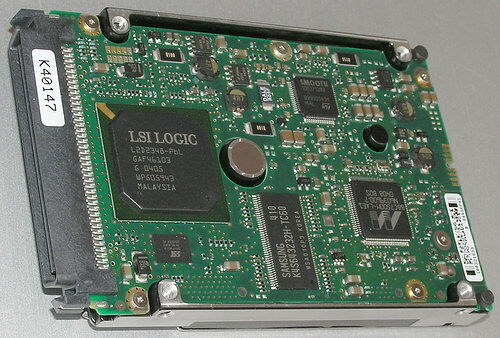 SAS drive Seagate Savvio 10K.1 from the direction of its controller with an adapter to two separate signal connectors and Legacy power supply (author's photo, 2004). 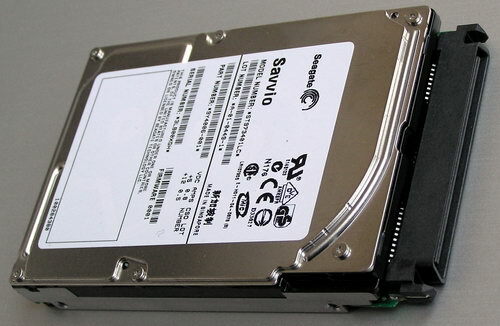 SAS drive Seagate Savvio 10K.1 from the direction of its controller (author's photo, 2005). 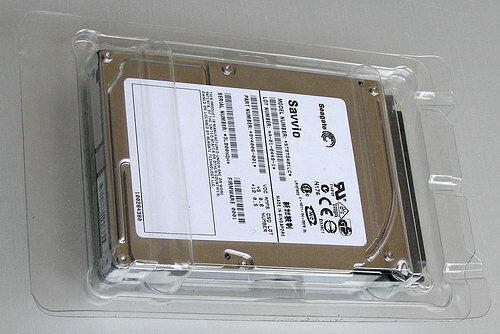 Seagate Savvio 10K.1 in a proprietary plastic package. By the way, the traditional (3.5-inch) Seagate box easily accommodates up to four 2.5-inch notebook drives, arranged thwart the box (even up to six, if you need! ), but this trick will not work with Savvio — it's longer and thicker, even a couple of these drives will not go in the box. Key characteristics of 2.5" and 3.5" 10K drives from Fujitsu and Seagate of the latest generation are published in Table 1. Unfortunately, Fujitsu 2.5-inch drives are not yet on sale, so we'll try to get back to them later. First of all it should be stressed that although Savvio storage drives are implemented in the 2.5" form factor (that is their length is standard 70 mm and their mounting holes are arranged relative to the base strictly in compliance with the standards for this form factor), their other weight/dimension characteristics do not blend with the traditional idea of such drives (such as hard drives for mobile solutions). Firstly, Savvii have non-standard thickness — 15 mm (notebook 2.5-inch hard drives have a typical thickness of 9.8 mm, several years ago they used to be 12 mm thick). Secondly, SCSI Savvio drives are slightly longer than the traditional for mobile drives 96mm (case) and 100mm (with a connector) — 100 mm (case) and 110 (with SCSI SCA-2 connector; however, SAS models will be shorter). Thirdly, Savvii are twice as heavy as their modern mobile counterparts (less than 100 g), even though they use the same formula — 2 platters and 4 heads maximum. But to do justice to Savvii, we should note that they still remain four times as lightweight and 70% as compact (70x110x15=115.5 cm3 versus 101x147x26=386 cm3) as their traditional 3.5" SCSI counterparts with the same spindle rotational speed. These drives use the same 65 mm 36.7 GB platters with maximum data density of about 70 Gbit per square inch as in Seagate Cheetah 15K.4. (and some other components). At the same time, the average seek time of Savvio 10K.1 is noticeably worse than in Cheetah 15K.4 — 4.1 ms versus 3.5 ms for reading and 4.5 versus 4.0 ms for writing. That's probably because there was no intention in this case to reduce the seek time by all means, so the efficiency of the solenoid drive (millisecond moves of the bracket with heads) was not sacrificed to access time. On the other hand, according to the claimed average seek time, 2.5-inch 10K models (both from Seagate and Fujitsu) are faster by 0.5-0.8 ms than modern 3.5-inch 10K models from the same manufacturers. That is their average access time is better approximately by 7-10%. Savvio drives use the new miniature 15-mm spindle motor on FDB, shorter and more reliable bracket with heads. And the reduced formula (2 platters and 4 heads maximum) reduces power consumption to 5 W when idle (versus ~8 W in Cheetah 10K.7) and up to 8 W in seek mode (versus ~12-16 W in Cheetah 10K.7). By the way, FC- and SAS-modifications of Savvio are not as economic as the first models with SCSI interface — their idle power consumption is 6.8(FC)—7.5(SAS) W and seek power consumption is 8.8(FC)—11.2(SAS) W! Idle and seek noise in Savvio drives is also significantly lower than even in Seagate Cheetah 10K.7. Non-operating shock resistance is better. What concerns disadvantages of Savvio 10K.1 drives, we can note a relatively little capacity of the models (36.7 and 73.4 GB), quite low linear read rate (63 MB/s at outer tracks versus 80-89 MB/s in modern 3.5" 10K models), as well as the fact that the minimum (claimed) seek time in Savvio drives is noticeably worse than in Seagate Cheetah 10K.7 (moving between neighboring tracks is twice as slow!). By the way, Cheetah 15K.4 offers the same low minimum seek time as in Cheetah 10K.7, it means it's a peculiarity of Savvio. It probably has to do with power saving and a slightly different Smooth driver chip (see above). In other words, all corporate devices, which require minimal size and still high performance and reliability of the data storage system. We used Seagate Savvio 10K.1 ST973401LC 73 GB. We tested this drive with three (at least) firmware versions — initial firmware 0001, the same firmware in Performance Mode (Desktop Mode, 32 constant segments of cache memory, see the details in our review), and with updated firmware version 0002 (in Server Mode), in order to see whether something changed in terms of performance with the new firmware version and how faster or slower this drive works in various applications with constant (instead of adaptive) segmentation of the buffer. We also publish results of Seagate Cheetah 10K.7 in two firmware operating modes — Desktop Mode (PM) and Server Mode. We used the previously obtained results for all modern 3.5-inch SCSI 10K drives for comparison purposes (see the links in the previous article), as well as the results of a famous SATA 10K WD Raptor WD740GD. All these drives, except for the last Seagate Cheetah 10K.7, had the capacity of 147 GB, while the marked drives (WD and Cheetah) were twice as small, that is of the same capacity as Savvio. As we recently found out by the example of Cheetah 10K.7, the performance difference between 74 GB and 147 GB models in the same series is not that significant to pay any attention to it in such comparisons. Hard drives were mounted firmly on the metal chassis of the PC case and blown over by a small face fan for a 5-inch bay. SCSI drives were connected to the system (one at a time!) with a short 20 cm cable, we actually used a SCA-WIDE adapter for models with SCA-2 (SCA-80) connector, which does not influence performance. The controller (non-RAID mode) uses Adaptec driver 3.0.0.0 dated September 2004. The tests were carried out under MS Windows XP Professional SP2. The hard disks were tested not partitioned (in Intel Iometer, H2Benchw and AIDA32 tests) as well as partitioned and formatted by regular operating system tools depending on a test type: one NTFS partition of maximum size for testing the average access time and plotting the read speed graph in WinBench 99 and two NTFS or FAT32 partitions of the same size for other tests (WinBench Disk WinMark 99, ATTO Disk Benchmark test, multithreaded read/write, and the Adobe Photoshop CS test). Each NTFS partition occupied half of the entire disk capacity (that is the second partition started exactly from the second half of the disk). FAT32 partitions were 32768MB, the first one starting at the outer edge of the media (on the "fastest" tracks), and the second — exactly from the middle of the media volume. NTFS and FAT32 cluster sizes were selected by default — 4 and 16 KB correspondingly. Before the tests, we warmed the hard disks for 20 minutes using a utility with active random access. 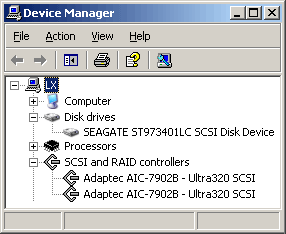 Seagate Savvio and SCSI controller in Device Manager Windows XP. Linear reading speed graphs are the first to go (click icons to see full-sized graphs). Seagate Savvio 10K.1 is obviously outperformed in linear transfer rates by all modern 3.5-inch 10K drives. The gap is large, as can be expected from the specifications. The best representatives of 10K models outperform Savvio by 40%, that is nearly by 1.5 times! Moreover, Savvio is actually much slower than even previous-gen drives with 37 GB platters (as in Savvio) — for example, Seagate Cheetah 10K.6 and WD740GD. Interestingly, if we multiply these Savvio performance values by 1.5 (15000/10000), we'll get the results close to those in Cheetah 15K.4 (as we remember, it uses the same 65 mm platters). It especially concerns the maximum rate (at the beginning of the platter), while the minimum rate and maximum-minimum ratio are noticeably different — Savvio's ratio is 1.46, the ratio of Cheetah 15K.4 is 1.64 (there may be two explanations, competing with each other). At the same time, Savvio's linear rate is approximately on the level of modern 3.5-inch SATA drives with the spindle rotational speed of 7200 rpm (there are a lot of professional models among them, including RAID models). It's especially nice that Savvio is faster in these parameters by 60-80% than the fastest (in the recent past) notebook hard drive — Hitachi Travelstar 7K60, which is a popular model for blade servers and similar professional products. Let's hope that we'll see a new generation of Savvio drives in the nearest future (with perpendicular magnetic recording and probably adaptive formatting), where the sustained transfer rate will be cardinally higher and will reach 90 MB/s. Ultra320 SCSI Savvio's interface transfer rate is the same as in other modern SCSI products from Seagate — they have the same controller. Interface data rate is up to the mark, irregardless of a measurement method. The only exception is the Desktop Mode, where (the same actually concerns Cheetah drives) some measurement methods provide unreally low results (Sandra is the most uncertain method here). The second (after the linear transfer rate) little disappointment awaits us in measuring Savvio's average access time for reading: despite the claimed 7.1 ms (and 0.6 ms advantage over Cheetah 10K.7), our model under review demonstrates only 7.4-7.5 ms and is faster than Cheetah 10K.7 by just 0.4 ms, being slower than the "full-weight" 10K leader from Maxtor. Thus, Savvio does not come up with our expectations for unprecedented low seek time due to miniature platters of Savvio — the difference from the majority of modern 3.5-inch 10K models is minimal. Note also that the average access time measured in Performance Mode under Windows is noticeably (by 0.8 ms) higher in both Seagate series, though electromechanical seek parameters must not be different here. That is algorithms for caching and segmenting cache-memory may have a direct effect even on such "simplest" "physical" parameters of drives, measured under an operating system. Savvio exonerates itself here a little, demonstrating much better results than Cheetah 10K.7 in both modes of segmenting cache memory and noticeably outperforming all the other contenders! A similar tendency is demonstrated in IOMeter as well. But in the last case, the Maxtor drive still manages to outperform Savvio in writing. In most cases (especially for Savvio and Cheetah), the average random access time for reading is much worse than the results, measured in other programs. These figures suggest an insufficient accuracy of measuring this parameter in IOMeter. So this graph is published for diversity rather than to demonstrate true results. By the way, we still noticed no differences between various firmware versions of Savvio. Another illustrative test of the "interior design" of the hard disks is the read/write speed on files of various sizes with various block sizes from 512 bytes to 1 MB. For this purpose I traditionally use ATTO Disk Benchmark. The screenshots below display the results for the four sizes of a test file — 128KB, 1MB, 4MB, and 32MB. While the first and the second file sizes are, as a rule, surely cached in the disk buffer (caching read/write data for a 1MB file is not that simple), there is simply no room to fit in the last file size. Caching the last but one file size depends not only on the buffer size, but also on the hard disk firmware (results of this test practically don't depend on the choice between FAT and NTFS). ATTO Disk Benchmark 2.02 results. Judging by these test results, we can draw a conclusion that Savvio firmware is very much alike the firmware for Seagate Cheetah 10K.7 in its operating principles and results — it's not optimized very well for caching streaming recording, for working with small blocks, and for caching files larger than 2 MB for reading. The fixed segmentation mode in Performance Mode (32 segments by default) results in the caching deterioration of reading blocks from 256 KB and larger (8 MB divided by 32 segments — just a tad less than 256 KB per segment). What concerns the difference between Savvio firmware versions, there wouldn't have been any, but for one little nuance — caching files for reading in the latest version (0002) stops being effective with 2 MB test file, while Version 0001 was very good at caching these files for reading. ATTO Disk Benchmark 2.02 results of Seagate Savvio 10K.1 ST973401LC. 2 MB test file. Having compared these results with the results in Performance Mode, we can draw a conclusion that the new Savvio firmware version has modified algorithms of adaptive segmenting/caching (in Server Mode) so that to increase the number of allocated segments of cache memory for working with streaming data (in particular, 1 MB and larger files ) by reducing their size (in other words — the lower limit was increased to 4-6 segments, while it could previously reach only 2-3 segments for reading streaming data). As a result of this upgrade, caching large (from 1 to 2 MB) data blocks for reading got worse. By the way, the number of segments for reading streaming data in SCSI Maxtor drive can probably go down even to 1-2 (judging from the effective caching of a 4-MB file). The reverse side of it in the new firmware version is the twofold improvement of the transfer rate for writing 512-MB blocks and 10-20% rate increase of reading small blocks. That's certainly welcome. These tests show that we can expect very interesting and ambiguous performance results from Seagate Savvio in various applications. That's what we are going to find out in the second part of our review.